located throughout the Midwest. We’ve been in business since 1907; in addition to offering the best industrial products, we have the experience and expertise to assist you with your most demanding applications. We are also committed to providing unsurpassed service through the implementation of innovative technologies and processes. Rupture pin valves are used in a wide range of applications. General-purpose pressure relief valves are ideally suited for slurry, mud and fracking relief tasks. 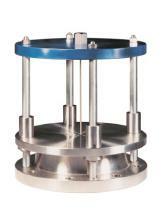 Pressure isolation valves are extremely effective for preventing damage to downstream equipment. Clean service valves can meet the pressure relief requirements in industries such as Food & Beverage and Pharmaceuticals. Other industries that can benefit from rupture pin valves include Pulp & Paper, Waste Water Processing, Oil & Gas and Well Drilling. SEMCOR is proud to offer an extensive selection of rupture pin valves from Rupture Pin Technology. What separates Rupture Pin valves from competing products is the uniquely designed and carefully crafted rupture pin that ensures consistent, accurate valve performance within extremely tight tolerances. The patented pin technology also ensures maximum safety during even your most hazardous applications. We also work closely with the staff at Rupture Pin Technology to provide superior customer support for our customers. Please take a closer look at our complete selection of reliable, high-performing pressure relief valves from Rupture Pin Technology. Feel free to contact us for additional information or to request product literature. Our staff can also help you select the best pressure relief valves for your applications.